You may have heard friends or family members talking about macular degeneration or possibly been diagnosed with the eye disease yourself. 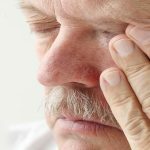 What is macular degeneration? As the leading cause of vision loss in more than 10 million Americans, you may be wondering what this eye disease is all about. It is a common eye condition that most often targets people over the age of 55. Macular degeneration does not lead to total blindness, but it does interfere with daily tasks such as the ability to see faces, drive a car, read a book, or fix small things around your house. Macular degeneration is an eye disease that affects your central vision. It is caused by the deterioration of the central part of the retina called the macula. The retina is the lining on the back of the eyeball that is sensitive to light. The lens of the eye focuses light onto the retina. The retina sends the information to the brain through the optic nerve. In the center of the retina is an area called the macula which is the most sensitive area of the retina. The macula collects detailed images and is solely responsible for your central vision. As the cells start to deteriorate, the macula cannot get good images to send to the brain so seeing objects and images straight ahead becomes difficult. When you start to explore what is macular degeneration, you realize that there are three distinct stages each with different levels of vision loss. Macular degeneration has very few symptoms in the early and intermediate stages which is why it is very important to have routine eye care exams. Early: During this stage, vision loss is rarely experienced, but various risk factors can make it progress faster. It is important to get your vision checked with regular eye exams because there may be a presence of medium sized drusen, which are tiny clumps of yellow protein that grow under the macula. A medium sized drusen is only the width of a human hair! In this stage, many people begin to explore what is macular degeneration so that they can take necessary action. Intermediate: While there are very few noticeable symptoms during this stage, the drusen are large and may cause some vision loss. 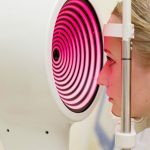 Only an eye exam can determine the size of the drusen and any pigment changes in the retina at this stage because there are still very few people who show any symptoms. Late: Vision loss is noticeable due to a damaged macula. Vision loss can come from dry or wet macular degeneration. Now that you have a better understanding of this eye disease, it is good to know that there are two types of late macular degeneration: dry and wet. The dry form is the most common as over 85% of people will develop this type. Dry macular degeneration happens with age as those tiny clumps of yellow protein called drusen grow under the macula. When this happens, the macula starts to thin and dry out which means that it can’t function as well anymore. Wet macular degeneration is less common, but far more serious. Abnormal blood vessels grow under the retina and then begin to leak fluid or blood which causes the macula to scar. If you are at risk for macular degeneration because of family history, age, or lifestyle factors, do not wait until you experience changes in your vision before getting an eye exam. Many people don’t even realize they have macular degeneration until their vision becomes blurry. While there is no cure for macular degeneration, you can slow the progression once you have been diagnosed. Your eye care specialist can detect early signs of macular degeneration before symptoms occur through a retinal exam including scans and photos of the macula. Since you now know what is macular degeneration, if you have been experiencing any blurriness or distortion in your vision, contact Dr. Barry Leonard right away for an exam. Even if you haven’t experienced any blurriness, he can examine your retina for any potential macular problems. Call Dr. Leonard’s office now at 818-891-6711 or you can make an appointment online.